Three For A Festive Glow. Let’s face it… I’m all about glowing all year round but there’s something extra special about that lit-from-within complexion that just looks so radiant this time of year. I’ve discovered quite a few glow boosting products this year, but I wanted to talk about my top three of the moment, for the perfect bronzed glow this season. I’m covering all price points from drugstore to luxe picks, and they’re all gems that I’ll be using all throughout December. Starting off with skincare, the Charlotte Tilbury Overnight Bronze & Glow Mask is such a beautiful gradual tan booster that gives a really golden and healthy appearance to the skin. I like to apply a thin layer of this all over my face and neck before bed and then wake up with a beautifully goddess-like glow which is perfect underneath makeup or to wear alone. It’s very subtle so don’t think ‘orange tan’ – definitely a very unique product for your skin. Onto some makeup picks to apply over skincare – both are from the drugstore and are very affordable picks for a beautiful festive glow. The first favourite is the good old Soap & Glory Glow All Out Luminizing Face Powder, which is seriously so much gorgeousness in a pan. I love applying this liberally all over my face for a beautiful luminosity to my skin which is perfect for party season. My final pick for highlight lovers are the Makeup Revolution Liquid Highlighter Drops – yes, you guessed it – literally molten shimmery elixir for your face! There are so many colour options and I have three from the range. My favourite is definitely Starlight, an opalescent frosted pink that makes cheekbones pop in the light. 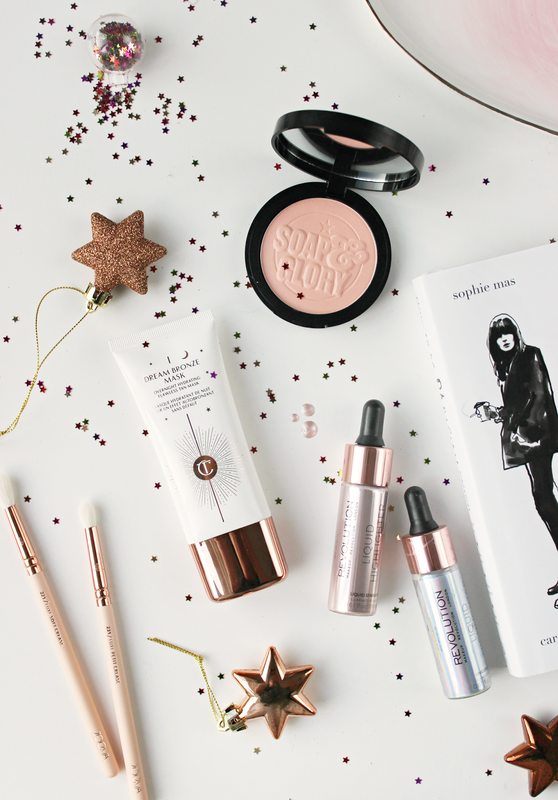 So these are my top three – what are your favourites for a festive glow this season? Next Post The Holiday Lip Edit.